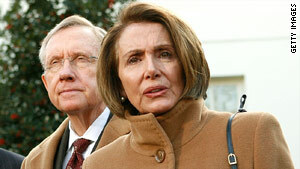 Senate Majority Leader Harry Reid and House Speaker Nancy Pelosi face a tough health care reform challenge. Washington (CNN) -- Republican Scott Brown's victory in Massachusetts has forced congressional Democrats and the White House to assess their agenda going forward. The historic win in the solidly Democratic state has put the brakes on President Obama's and congressional Democrats' key legislative initiatives: health care reform, climate change and a second stimulus. Obama's agenda already was in trouble before the GOP victory in Massachusetts, said Larry Sabato, director of the University of Virginia's Center for Politics. "The Massachusetts special election crystallized just how much trouble Obama's legislative agenda was in," he said. "The sense I got was that members prior to Christmas didn't really think that most of Obama's agenda was going to pass anyway after health care." The reason, Sabato said, that in the coming mid-term elections, conservative Democratic members may feel they'd already given Obama enough support. CNN Political Editor Mark Preston notes that heading into 2010, Obama already faced a tough task of convincing congressional Democrats to rubber stamp his agenda. But the loss in Massachusetts makes it even harder for him to get other bills passed. "While he still has the support on Capitol Hill and and overwhelming majorities in both the House and Senate, conservative Democrats from the South and the Midwest are going to think twice about supporting him on every issue," Preston said. Video: What do Independents want? Democrats trying to push through the president's agenda without Republican support will almost certainly cease, analysts said. With the 2010 elections coming up, Republicans will paint their counterparts as out of touch with the public's message: Do something about the economy. In Massachusetts, Brown successfully tapped into anger against the government's domestic agenda -- though many note it wasn't a referendum on President Obama. Brown's victory almost stopped health care reform in its tracks. The election stripped Senate Democrats of the 60-seat supermajority needed to overcome a GOP filibuster. Brown's 41st vote has put the onus on Democrats to come up with contingency reform plan. Democrats were trying to merge House and Senate health care bills when Brown's election changed the political climate. Democrats are looking at a compromise on less controversial parts of the health care reform plan -- including barring coverage by insurers based on pre-existing conditions and closing the Medicare "doughnut hole" to bring down prescription drug costs. But Republicans remain in near lock-step against the current bill and have suggested Congress start from scratch with greater bipartisan talks. Douglas Holtz-Eakin, a former Congressional Budget Office director, said that if Obama wants to help shore up independents' support, he needs to make jobs the priority. "He genuinely has to put jobs first. If you do health care for a year, you didn't put jobs first. So if you're serious about jobs, you don't say you're going to do an energy bill or a cap-and-trade climate bill. You put jobs first." Holtz-Eakin has said that Brown's victory is a clear signal the country wants a new direction, including starting from scratch on the jobs bill and greater bipartisan support. Republicans, he said, would like to see a bill that focuses on tax cuts, such as blanket breaks on payroll taxes and capital dividend taxes. Congressional Republicans and even some conservative Democrats would likely coalesce against any bill that includes more spending, especially with the economy to be a top election year issue. In order to turn the tide, Obama must focus on helping the business community, Holtz-Eakin said. He added that the president's agenda is "so scary to the business community that while they've stop firing, they're not hiring." "They have to put some of those wonderful rhetorical flourishes aside, stop scaring the business community and put people on the payroll." Democrats had planned to get health care done first then turn their attention toward jobs but they have shifted to getting a jobs bill out sooner rather than later. "Jobs, jobs, jobs," said Senate Finance Chairman Max Baucus coming out of a Friday morning meeting to discuss the package. The Montana Democrat would say only that Democratic senators talked about a "series of initiatives" with the goal of helping to create jobs. Federal Reserve Chairman Ben Bernanke's job is suddenly in trouble. Bernanke, whose term ends January 31, could be in jeopardy of not being confirmed by the Senate. White House and Senate leaders are beginning to scramble as an increasing number of Democrats say they will vote against Bernanke. Democratic Sens. Russ Feingold of Wisconsin and Barbara Boxer of California have both issued statements announcing opposition to Bernanke. "Under the watch of Ben Bernanke, the Federal Reserve permitted grossly irresponsible financial activities that led to the worst financial crisis since the Great Depression. Under Chairman Bernanke's watch, predatory mortgage lending flourished, and 'too big to fail' financial giants were permitted to engage in activities that put our nation's economy at risk," Feingold said. Boxer said she's voting no because Bernanke "played a lead role in crafting the Bush administration's economic policies, which led to the current economic crisis. ... Our next Federal Reserve chairman must represent a clean break from the failed policies of the past." Democratic concern about Bernanke boiled over in a private lunch of all Democrats on Wednesday, the day after Democrats the Massachusetts vote. The Fed chairman has had a number of critics in the Senate -- namely Bernie Sanders, an independent from Vermont, and Kentucky Republican Jim Bunning. Bernanke does have bipartisan support, at least on the Banking Committee. Four Republicans joined Democrats in voting yes last month. When Bernanke was confirmed for his first term in 2006 under President Bush, his nomination was approved unanimously. Before health care imploded, climate change was the hot-button partisan issue in Congress. With Brown's victory, the bill is almost certainly dead, Sabato said. The proposal would reduce nationwide greenhouse gas emissions 17 percent by 2020 and 83 percent by 2050 through a so-called "cap-and-trade" program under which companies would buy and sell emissions credits. It would also require utilities to generate an increasing amount of power from renewable sources. Republicans have argued the bill could hurt the country's battered industrial base while pushing polluting industries to countries with lower environmental standards. In late June, a White House-backed climate change bill passed 219-212 in the House, with almost no Republican support and opposition from some Democrats. It has since been stalled in the Senate. Sabato said that many House Democrats are probably not pleased with their vote on the bill, especially with the election coming up. "Do you think those shaky Democratic House members are real pleased about the fact that they were forced to vote on climate change when it had no chance of passing? They are stuck with this vote next November. That's just politically stupid."